Spitty is actually a name but I thought today was as good a day as any to tell you about the super wonderful package he sent me. I had to earn the package first and I did by providing the first correct answer on his blog to name that tune. It was too easy for a world renown DJ such as myself and I told the Spitster that I really shouldn’t get a prize but he insisted. I’m not really one to look a gift-cat in the mouth, so I relented. Jailhouse Rock happens to be one of TW’s Top 10 songs of all time even though she was a wee babe when it was released. I can’t believe they even had radios and recorded music when she was a wee babe. Spitty’s human must have heard them on some retro station cos no one is as old as TW. I knew Folsom Prison Blues cos I just did a parody of it last year. 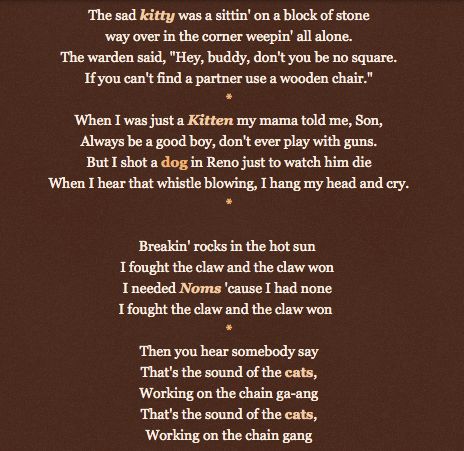 The last one was the hardest cos while TW could sing it, she just couldn’t place it. She kept thinking of the Pretenders Back on the Chain Gang. Finally with a little help from Pop and her good friend Mr. Google, her memory was jogged. Now, back to Spitty's package. Heh heh! It’s big … it’s bold … wait, not that kinda package. Whoa, talk about the hits keep on coming … the gifts kept on coming—one better than the next. There were cans of my fave grilled tuna Fancy Feast, a bag of my fave Greenies SmartBites, my fave crinkle balls, a snaky like he has and even a gift for TW. 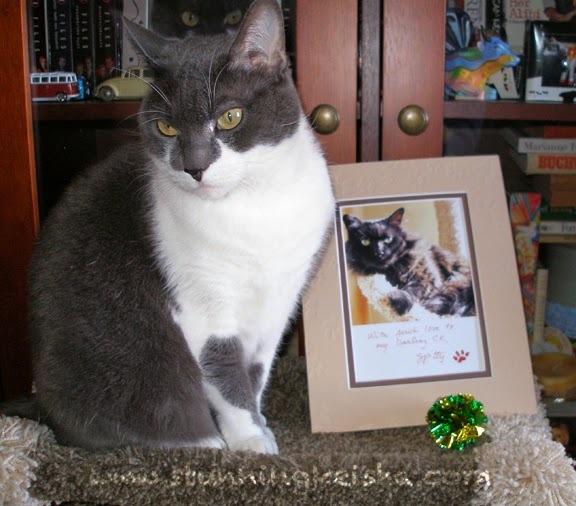 Wrapped in a sweet ribbon was the best present: his pawtographed photo. SIGH! C’mon, TW, open the card! Stat! Hop to it! HURREEEEEEEE! … OR I could bite TW when she held the furs up for me to smell. Which one do you think I did? Hint: the photo lies. Spitty sure snoopervised the packing too. There was loads of tissue paper, which will last forever the way TW doesn’t put it out for me. This was the best package ever! Thank you, Spitman and your human, for such a wondrous giftie. Don’t get discouraged, girlcats, there’s enough Spitty to go around. I certainly don’t want Mr. Spittylicious to take himself off the market. When I read the card and inscription on the photo, I know where I stand and that’s good enough for me. CK - Is not Spitty the bestest? Its a good thing us girl cats never get jealous! Wow, CK! Spitty knows how to treat a girl right. DJ CK you won that paws down and what a wonderful prize from Spitty. Enjoy. Have a wonderful Wednesday. Oh wow! What a pawsome prize!!!! And sheesh! You bit your mommy ?? BOL you crazy cat!! Enjoy your super cool gifts!! WOW CK! You done hit the Spitty jackpot! You are amazing giving answers for all these songs. Just a piece of cake for renown DJ! Way to go, CK! Those lyrics were really tough for me to figure out but like you said you are a world famous DJ! :) Enjoy your cool prizes! 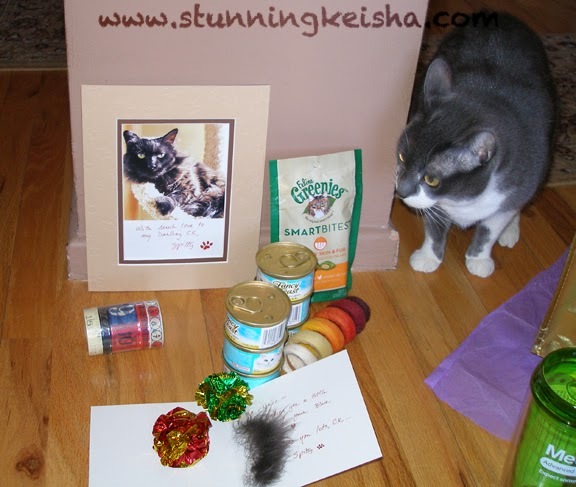 Wow, lots of cool stuff, and a pawtographed photo! lucky girl! You are one lucky kitty, CK! That is an awesome package! Concatulations on winning. We hope you don't get too lost staring at that awesome photo of Spitty… We know we could! WOW - CK, what a great package you received for naming the songs. You are a true DJ girl - know your music and the words to boot! Good job and enjoy your reward. The Human laffed cause she forgotted she put in the silly tape for TW, ha ha ha! Not to tape YOU to anything, I hasten to add! Maybe HH Gutt though, if he's realy norty some day. 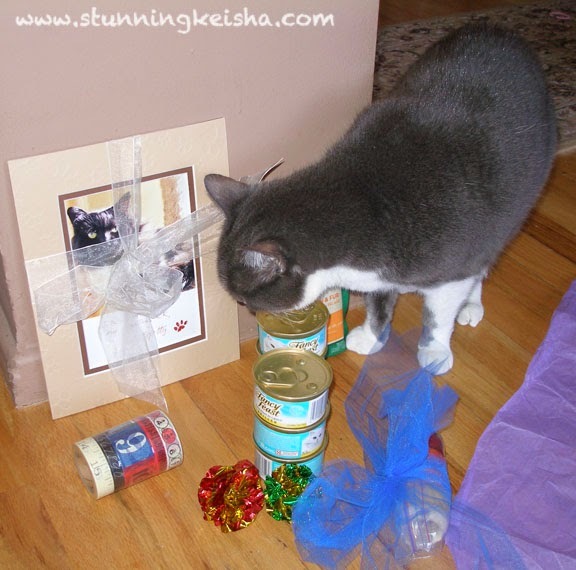 CK, that is one pawsome prize package. And you sure deserve it for guessing all those songs. What an awesome package! ..um, I mean prize!!! We're not surprised you swooped in with the correct answers to that quiz! PS...now how do I explain "bold" to Waffles? Well CK, considering you're a famous DJ I'm not surprised you were the winner of "name that tune".....Spitty rewarded you quite nicely for that I see! Lucky you! Spitty is DA KING! Spitty really did a fantastic job. 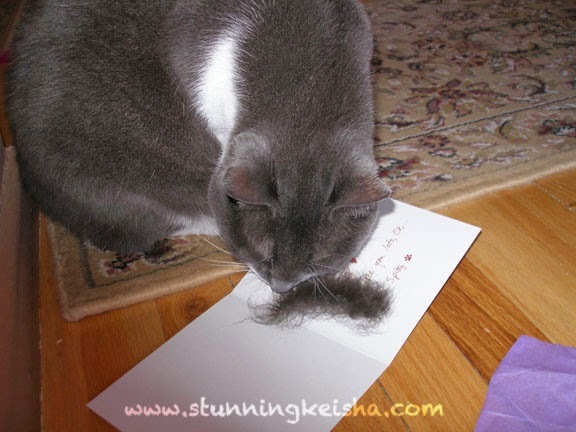 You just gotta love the mind of a cat who also sends some of his furs! He definitely thought of everything. So many good thing´s Spitty sent to you ! Excellent! AND you got to bitey your TW.